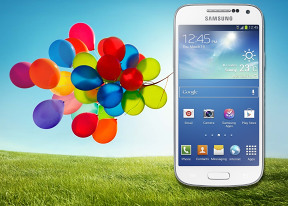 The Samsung Galaxy S4 mini comes with an 8MP main camera and a 2MP front-facer, but unlike its bigger brother, the smartphone can't use both t the same time. The user interface is based on the Galaxy Camera interface. The viewfinder handles both still and video capture, so you don't have to switch modes. However, this is certainly not the most convenient solution - if you're shooting full resolution 8MP photos, you'll have to frame your videos using a 4:3 viewfinder. In the upper left corner, there are a couple of quick settings plus an arrow to reveal more options. As for the different camera modes, it's a collection of some of the best camera features currently available. The arrow at the bottom of the screen brings up a row of color effects. Each effect gets a live preview, so you can see what the particular scene will look like with it. There's a download button so you can grab more effects. There are more settings in the top left corner, but they won't be very often used. Still, there a number of interesting options here like having the volume rocker act as a still shutter key, a video shutter key or a zoom lever. The HDR mode (Rich Tone) can be set to save a normal and an HDR photo or just the HDR one. Another interesting option is contextual file names - the Galaxy S4 mini will name photos with your location (the GPS needs to be on for this to work). Let's go over the different modes. There are standard modes like Rich Tone (HDR), Panorama, Night and Sports. Panoramas are nice, they do a full 360° circle, but the resolution is not that impressive. Then we get into the more interesting shots. Drama mode takes a moving object and clones it several times. Note that the resolution for this mode drops to 1080p. Sound & shot captures a photo and records ambient sound. It sounds pretty cool - for example, you can hear the sea gulls in a beach photo or the roar of car engines if you're at a race. The Samsung Galaxy S4 mini unit we're using for this preview hasn't got its hardware and software finalized, so we'll leave the image quality discussion for the review. Still, we snapped a few shots to give you a feel for the image quality. And here is a 1080p@30 fps video sample taken with the Galaxy S4 mini. Just don't forget this is a pre-release unit.